Once again Cosmos Gaming was able to cover the Rock on the Range festival in Columbus, OH. The two day event has become one of the premiere US events for rock fans to see some of the bigger names and plenty of up and coming acts. As with last year, we had resident interviewer and Fans 4 Bands owner Mario Trevizo on hand to do a whole slew of interviews. But this year we’re doing something different, and instead of transcribing the interviews and making you read them we have shot everything as a video and are displaying them directly on the site. The eighth interview that we’re uploading for you is Disturbed. 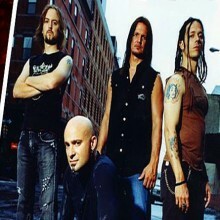 Disturbed has been a mainstay of the hard rock scene since 2000 when their debut album The Sickness was released. Their newest album Asylum was released last year. Check below for the full interview. We’d like to thank Mario Trevizo for once again conducting interviews for us, and urge our readers to check out his music promotions site Fans 4 Bands at http://www.fans4bands.org/.